The main Sweden league (Allsvenskan) is coming to an end. The champion is almost already known, but for the 3rd place (participation in European competitions) 3 teams are fighting. So far (4 game weeks before the end) Hammarby is in a better position. The team hosts Kalmar, 10th team in the league. The team of Corner-stats.com as always looks at corners. If we consider only the home matches of Hammarby in the 2018 season in Allsvenskan, then Hammarby takes the second place on the individual total of corners with an average value of 7.08 corners per match. It is logical that at home Hammarby will play in this match to win, attacking a lot, so it is logical to assume that there will be a lot of corners, more than the average, but Kalmar will only have to punch through 4 corners to break through the total. 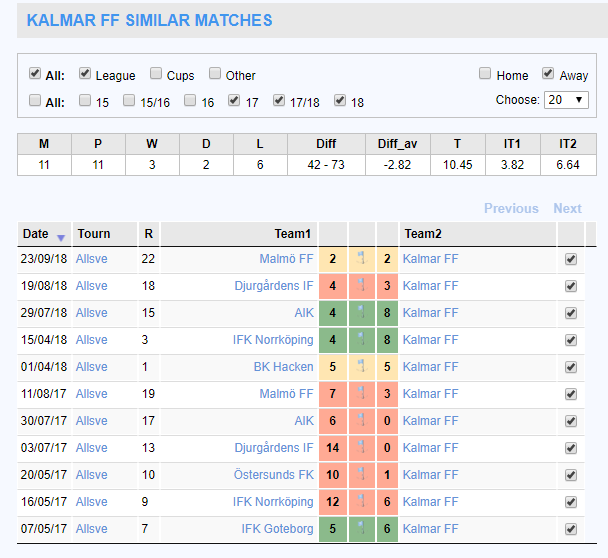 8 out of 11 away matches of Kalmar with teams like Hammarby in the 2017-2018 seasons (this statistics can be seen in the screenshot below). The team of the site Corner-stats.com believes that the bet on the Asian total corners over 10 at the odds 1.925 at Bet365 is attractive.